No, this error isn't punctuation-related, but it's pretty bad nonetheless. Also, it should say iced coffee, not ice coffee. And let's not even talk about the bad clip art. Ha! What an awful spelling mistake! 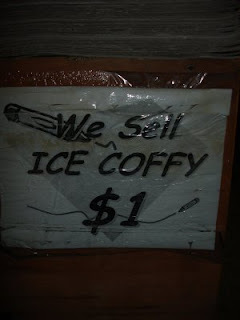 Out of curiosity, I wondered if there was such a thing as "coffy." Apparently there is--and it's a blaxploitation film! Weird. Hahahaha, that's hilarious. I love Pam Grier. I'm guessing the clip art refers to "tastes like water with a brown crayon dipped in it," i.e., the quality of the product being directly proportional to the quality of the signage. And they even threw in some italicized comic sans font to complete the horror show. I Should Dress as Lynne Truss for Halloween! Extra, Extra! Read All About the Bad Punctuation! Will They Play Kool & the Gang?